Several months ago – about 3, I made a public commitment to make the data I have generated during my Phd open and available online. Well I have not ignored this and in the interim I have been investigating various ways I can do this. Not only do I want to make it available but I want to structure it in a standard form, namely the gelML format. In addition, I was involved in developing it the specification and therefore, I have somewhat an obligation to use it. As it is an XML transfer format I needed to be make changes and revision it, like developing code, so in that sense recording the data on a wiki or blog would not be appropriate. For this reason I have chosen to create a google code project for gel electrophoresis data and do everything in subversion. You can browse the subversion repository or check it out anonymously. The geML file that will eventually (as its still very much a work in progress) contain the data is here. As I am doing this, I though I might as well publish my lab book while I was at it. This will be done using LateX and the pdf that gets generated can be found here. To date, this is still a work in progress and a reverse engineering project, as the experiments are not being done live. It may take a while to complete but in the end I hope presenting my data in gelML and making my labbook available can be more of a benefit than decomposing for years on cellulose. MIBBI is a registry of scientific experiment reporting guidelines with the idea to foster a foundry of best practice to further develop and encourage modular development and re-use of reporting guidelines. 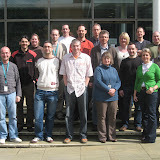 The first workshop is being held at the EBI on the 2nd – 3rd April 2008 and is a relatively closed workshop to those developers and guidelines that are registered on the site. The schedule for day one is a whistle stop tour consisting of 5 min talks (adjusting for an academics interpretation of what 5 minutes means) for all the guidelines that exist, their scope and the people behind them. Due to this I am not going to comment on individual talks. I presented two talks during the day. One on CARMEN and the development of the MINI: Electrophysiology reporting guidelines, and one, standing in for Andy Jones on FuGE. I tried sharing these slides via google presentation, they looked quite nice. However, wordpress does not seem to allow them to embed. So I put them on slide share instead. These set the tone for the discussions for the afternoon and tomorrow. You are currently browsing the archives for the data standards category.